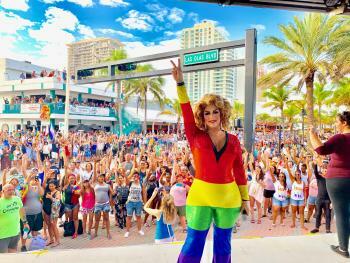 GREATER FORT LAUDERDALE, Fla. (February 27, 2019) — More than 120,000 visitors from the U.S. and beyond experienced the 42nd annual Pride Fort Lauderdale festival, which took place from Thursday, Feb. 21 through Sunday, Feb. 24 in Greater Fort Lauderdale. The carnaval-themed festival included the first parade ever held along iconic Fort Lauderdale Beach. Winners of the parade included: Dillard High School, marching band; Flockfest, walking group; Wilton Manors Police Department, decorated vehicle; iHeart Media / 93.9 MIA, float; and Trans Pride, best interpretation of Carnaval theme. Judges included Stacy Ritter, Greater Fort Lauderdale Convention and Visitors Bureau; Ina Lee, Travelhost Media Group; Norm Kent, South Florida Gay News; and Rod Hagwood, South Florida Sun Sentinel.